Your Premier Orange Beach Wedding Planner! Want a unique location to host your wedding? 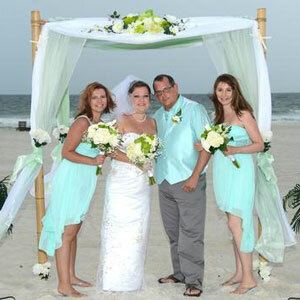 Orange Beach, Alabama is a gorgeous destination for a beautiful beach wedding. The 32 miles of sugar white sand beaches have formed from quartz grains washed down from the Appalachian mountains, and are super soft underfoot. The gulf waters of Orange Beach are mild, and the waves are gentle, providing the perfect backdrop to your ceremony. What better place to tie the knot than on soft sand, under clear blue skies, with the sparkling ocean waters behind you? Your ceremony is instantly elevated when held at the beach, framed with natural elements. Your guests will love attending your wedding on the beach, and appreciate that this tropical location is not that far away! A destination wedding is a way to make a wedding truly unique and memorable, and Beach Weddings Alabama gives you an amazing backdrop on your special day. If you want to wow your guests, have the best backdrop for pictures, and love natural beauty, the beach is perfect for you. The best part about a beach wedding in Alabama is that it feels worlds away, but is conveniently located a quick plane ride from almost everywhere in the United States. You don’t have to travel internationally to have an amazing destination experience, your tropical escape is waiting for you on the gulf shores of Alabama! Your guests are sure to appreciate that you have taken them to such a wonderful location without the hassle, cost, and time of international travel. 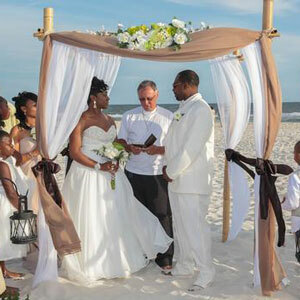 The perfect outdoor beach wedding has the perfect weather, and Orange Beach has great weather year round. The hot summers are tempered by the gulf breezes, making the days bright, sunny, and inviting. The fall and winter months feature warm days and mild, cool nights, so whatever time of year you are planning your wedding you really can’t go wrong! When planning your dream wedding you want the best weather, and when you have your wedding in Orange Beach it is always beautiful. Love the idea of getting married outdoors but the climate where you live doesn’t cooperate with your wedding date? Choosing Alabama’s shores for your wedding allows you to have your outdoor dream wedding year round! 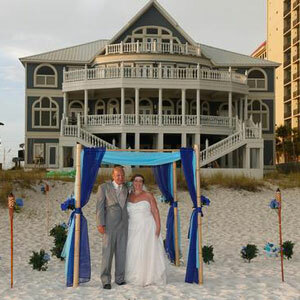 Whatever time of year you are looking to get married, Alabama’s Orange Beach will be perfect! Does wedding planning have you stressed? Do you want to plan a beautiful wedding on the beach but just don’t know how to get started? Beach Weddings Alabama is here for you! We want to help you plan the perfect wedding that is free from stress, and gives you access to the best wedding planning team in the area. We have chefs, cake decorators, wedding photographers, florists, DJs, pastry chefs, pastors and coordinators who all work together to create a truly special experience for each of our treasured couples. Coordinating all of the people involved in your wedding can seem impossible, but with Beach Weddings Alabama we have a team that can craft the wedding of your dreams. If you want a wedding that is polished, where all the details have been thought of, that your guests talk about for years to come, you need to choose Beach Weddings Alabama! Weddings can be expensive, and here at Beach Weddings Alabama we don’t think that price should stand in the way of having the wedding you want. We realized that to offer our clients the best in wedding planning at the best prices we would have to bring all of the details in-house. We are the only privately owned, non-hotel, non-restaurant wedding planning business in the area, and we are able to offer you wedding packages at significant savings. If price has been holding you back from having your dream wedding we can help! A beautiful wedding, on a gorgeous beach, with the food, music, cake, and photographs taken care of—all at an affordable price. That is the difference that Beach Weddings Alabama brings to your Orange Beach wedding and we would love to show you what we can do for your wedding! All of our packages show the price of the entire wedding—there will be no surprises or hidden fees! The only additions to the price you see, will be any applicable sales tax and a small 6% gratuity. We are the only wedding provider in the area that owns their own wedding venue! This means that your reception is held in a space dedicated to making special wedding memories, not a bland box that hosts different events. We don’t do birthday parties there, we don’t hold conferences, we only host weddings! Our space was designed with the express purpose of being the perfect backdrop for couples to celebrate with their family and friends. You won’t be sharing your space with a noisy restaurant, or trying to cover up a space that obviously holds business events. 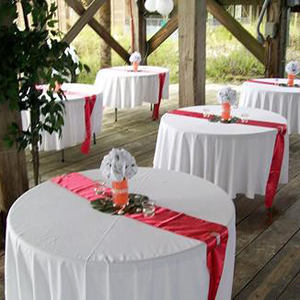 Our reception hall is the only one of its kind in Orange Beach, and we spent countless hours ensuring it was perfect! Our Pergo flooring, Italian marble counters, crystal chandeliers, and carved mahogany bar add that elegant touch that every couple wants for their wedding! We also use custom ambient lighting to give the space a romantic glow! Our state of the art sound system will get everyone dancing, and our and we have a dedicated dance floor, and lighting that can make it seem like you are at your favorite club! Not only do we have the perfect space for your reception, we have all of the tables, chairs, linens, and more that you would usually have to coordinate separately! This amazing space is included in all of our all-inclusive packages as a courtesy to you! When planning your wedding there are so many details to think of, people to hire, times to coordinate, and ideas to try to remember. This can be overwhelming for many couples, and can turn what should be a beautiful event into one that is stressful, time-consuming, and that leaves you feeling like you are always forgetting something. When you choose Beach Weddings Alabama, you are harnessing a combined 100 plus years of experience in the wedding planner industry! It takes a long time to perfect your craft, and we are proud to bring you the best of the best in the wedding planning industry. You don’t need to be an expert in cakes, catering, photography, flowers, and music to plan the perfect wedding—you just need to hire the best! At Beach Weddings Alabama our only focus is on providing our clients with dream weddings, each one handcrafted by our dedicated staff. Harness our expertise and dedicated staff to create the wedding of your dreams!